Sized just right with integrated bungees, this bag is made for bike share baskets. From New York to Chattanooga, bike-sharing systems have become a game-changer for commuters and visitors alike. But trying to wedge your stuff into those weird little front baskets? Game over. With just the right dimensions and integrated bungee cords, this bag is designed to make the most of that cargo hold while it keeps your essentials organized and secure. 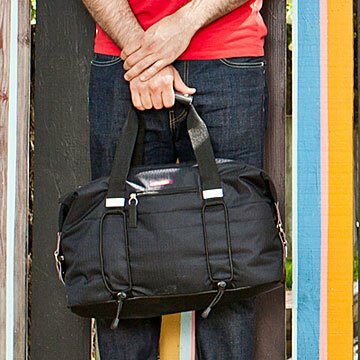 It incorporates two exterior pockets with key fob, five interior pockets including a removable padded sleeve that fits up to 15-inch laptops, and an adjustable and detachable shoulder strap. Made in China. We visited Bike Share Bag designer Maria Boustead in her Brooklyn workspace. Check out our interview on our blog. Apply a small amount of dish soap onto the stain and gently rub it with a damp towel. I bought this as a gift for my sister and she is loving it. She had a lot of trouble finding a stylish bag to commute with and this fits divvy perfectly. Also big enough it is useful for short weekend trips.